This online braking distance calculator is designed for a wide range of applications and can calculate two of the following five sizes - depending on the road or track condition: braking distance & overall stopping distance, (braking) time, starting velocity, final velocity and acceleration/deceleration. In addition, the thinking distance is calculated, too. This calculator doesn't use the familiar fist formulas. The calculation is performed with the exact formulas. By default braking distance and overall stopping distance are calculated for the following conditions: starting velocity is 100 km/h, the roadway has to be dry, clean, flat, straight and sealed. Reaction time is one second. Under Condition you will find suitable values for road and rail vehicles. There has to be a number in 3 out of the next 6 fields. * This value is automatically entered by selecting the condition, can be changed as required anytime! For a deceleration, set a minus in front of the number! ** There has to be a number in one of these two fields only! The maximum deceleration is entered in the calculator above! * Change the rail or road condition in the first calculator; assumption: all wheels are braked. ** Negative values are possible, too! *** The meaning of the two abbreviations l and h can be found here: General Information. The calculation is only valid for uniform acceleration or constant deceleration. In curves, there is less acceleration or deceleration possible. It is assumed that all the wheels are braked or driven. Accuracy can not be guaranteed - for corrections or additions please use my contact form! Examples for the Use of these Calculators - not finished yet! A vehicle travels on a dry and even road through a village. Its speed is 50 km/h. Suddenly a child jumps onto the street. How far away from the child does the car have to be so that it can stop just in time? A reaction time of one second is assumed. Now the road is wet. What's the car's speed at time of the accident? The driver runs illegally at 60 km/h through the village. The stopping distance should be the same as in a). What's the car's speed when it is hitting the child? 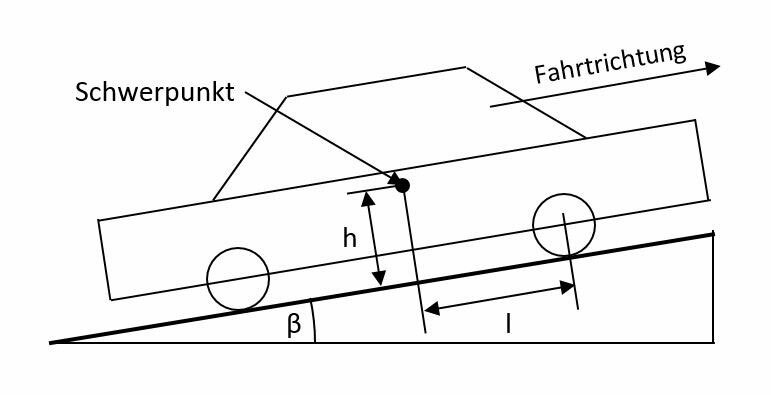 The car's initial velocity is 50 km/h, a reaction time of two seconds is assumed. What stopping distance does the vehicle have? In the "starting velocity" field, you have to put in the value 50 instead of 100. Then press "Calculate" or the Enter key. To be able stopping just in time, the car must be 24.812 m away from the child. For the correct answer, of course, the stopping distance has to be taken. After entering the values, do not press the "Calculate" button immediately. First, change the condition to "Wet roadway" (click on the small arrow). The result is 33 km/h. For this calculation, you have to put in the value 50 in the "starting velocity" field. Let all the other values as they are - then select "Dry roadway". Under these conditions, the car is still about 42 km/h fast! First reset the calculator. As "Reaction time" choose 2 and replace the "Initial speed" by a value of 50. The total stopping distance is 38.701 m, the braking distance is 10.923 m. The difference between the two numbers gives the reaction distance: 27.778 m.
In this case reaction distance is already greater than the total stopping distance from a). So the car hits the obstacle at full speed! Overall stopping distance is the sum of braking distance and thinking distance. The total time for braking is made up of reaction time and braking time. 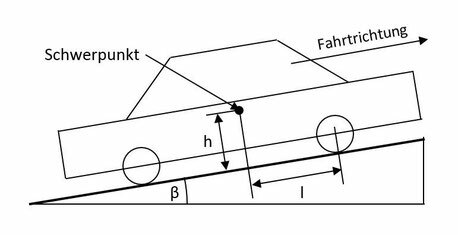 In the following diagram you can find the distances h and l which are required for the calculation of the overturn of a vehicle. Figure 2: Formulas for calculating braking distance, acceleration, velocity and time; Starting velocity is not 0. Figure 3: Starting velocity is 0.